Here is my first Buffalo Bayou review to go up on the site. I have had the pleasure of enjoying a few of their beers before the site began, but now I am ready to help spread the good name of Buffalo Bayou brewing Company here. Buffalo Bayou Brewing Company comes to us from Houston, TX. They started in 2011, and since their beginning, they have created some excellent beer for the masses. They release their beer in two different series, the Heritage Series, which takes traditional brewing techniques and add a modern touch with local Houston flavors, and the Secessionist Series, which is their ambitious and boundary-pushing brewing series. 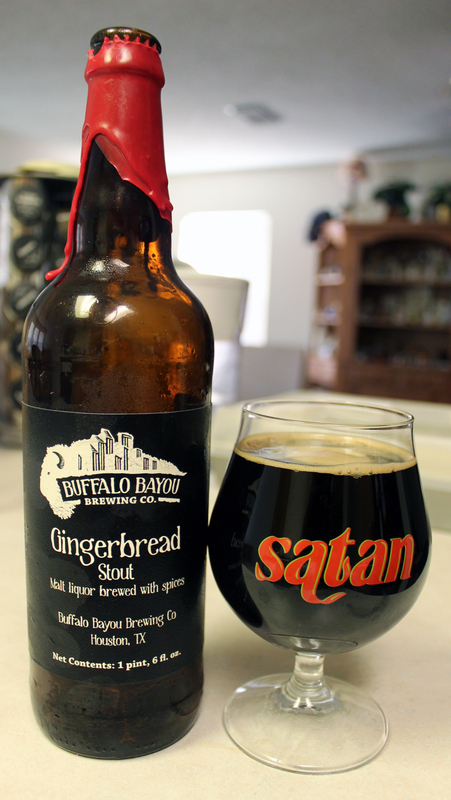 Gingerbread Stout was the first beer in the Secessionist Series. I used my Satan logo snifter glass by Brouwerij De Block for this beer. Gingerbread Stout poured an opaque, damn near black, dark brown color, topped with a thin crown of tan head. There was no head retention at all on this beer, as it quickly dissolved away soon after snapping the photo for the site. There was no lacing left on the glass at all. The nose on this beer is mostly spices. There are notes of cinnamon, nutmeg, sweet brown sugar/molasses, some ginger, a hint of chocolate, and some malts. The spices are not overpowering or very strong. Everything in the aroma is all balanced and subtle. The taste of this beer offered up something a bit different than the aroma. The taste was a lot heavier than the aroma made it out to be. The spices were strong, and hit the plate like a ton of bricks. There was a lot of nutmeg, and cinnamon with a backbone of sweet brown sugar/molasses. A tiny taste of ginger and chocolate show up at the end of the drink, but not much at all. The body is a lot lighter than I expected it to be. It was already heavy in the spice flavors, and the light-medium thickness actually helped make this beer easier to drink. The mouthfeel was smooth that ended with a nice dryness. As I said earlier the last flavors that hit the palate are ginger and chocolate , so the dryness at the tail end of the drink really suites the taste. Not much carbonation to this beer, either. Overall, I will say this is a very decent winter/holiday beer. While, it didn’t knock me out of my socks, it also didn’t lose my interest either. I did enjoy this beer on a cold day, sitting outside, so it was a perfect beer for the occasion. I do look forward to having this beer again later on this year again. Metal Connection: As a an of both the Houston Craft Beer scene, and Metal scene, I thought it would be fitting for me to include a local Houston band as the Metal Connection for this beer review. I give you Legion. Years ago, when I was a concert promoter, I used to book these guys and after a couple of local shows, their fan base seemed to grow here in San Antonio. I also have seen these guys gain overall popularity over social media sites. 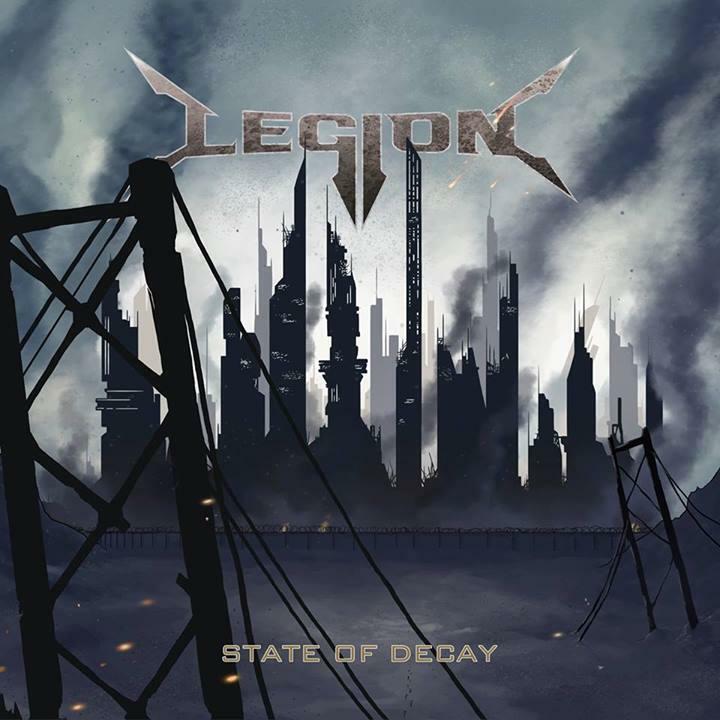 Legion are a young band who have been active since 2008, and released 1 demo, 1 EP, and 1 full length album. Their full length album was released through Metal Rising Records, a sub-label of Brainticket Records in 2013. The song included here is the title track from this album, State of Decay.